The 2009 EISA contains the current efficiency regulations for a wide variety of equipment and industries. 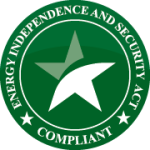 On January 4, 2007, President George W. Bush approved and signed the “Energy Independence and Security Act of 2007”. A portion of the Act includes new regulations on Walk-In Coolers, Freezers and Refrigeration Systems. We would like everyone to be aware of the guidelines that were put into effect January 1, 2009. U.S. Cooler® is fully compliant with these regulations. Click the following links to review the 2009 Security Act. In accordance with section 312 (c) of the Energy Independence and Security Act (EISA), the U.S. Department of Energy (DOE) published a Notice of Proposed Rule making (NOPR) for the test procedure on walk-in coolers and freezers. The NOPR is the first published document for the test procedure rule making process for walk-ins. DOE proposes the procedures explained in the NOPR be used to test walk-in equipment for certification, compliance, and enforcement of the energy conservation standards.